The proper way to write a thank you note. With technology right at our fingertips, it hardly seems necessary to hand write a letter or note now-days. 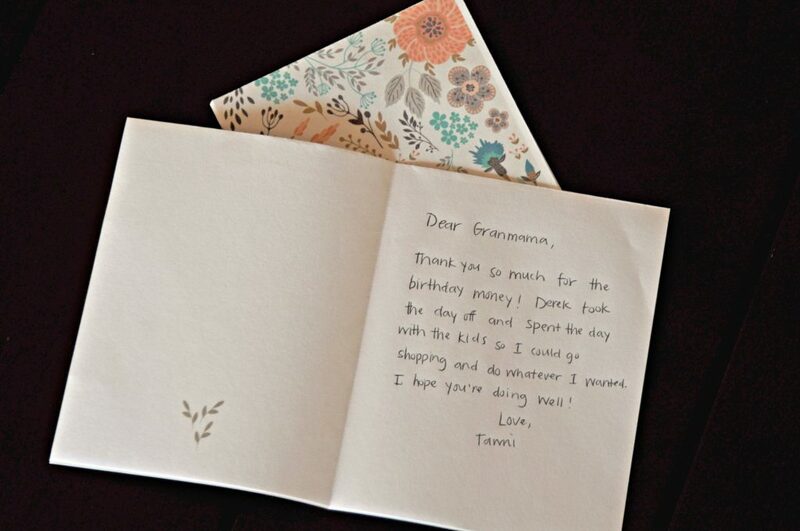 However, that is not the case, which leads me to explain why I wrote this post: How, Why and When to Write a Thank You Card for All Ages. Yes, to hopefully help you, but also to get myself into a GOOD habit and life skill again. I readily confess, my sister-in-law Ruthann is my example and guide in this area of writing Thank You notes. She and her family write them regularly and often. When my kids were young and growing up, I did much better at helping them get theirs off in the mail when a gift would arrive, or after a birthday or holiday. I even did alright some years later delivering them to neighbors for kindnesses done and help given. But the last years have taken their toll on my energy, time and drained me of focus on some important details – this being one of them. 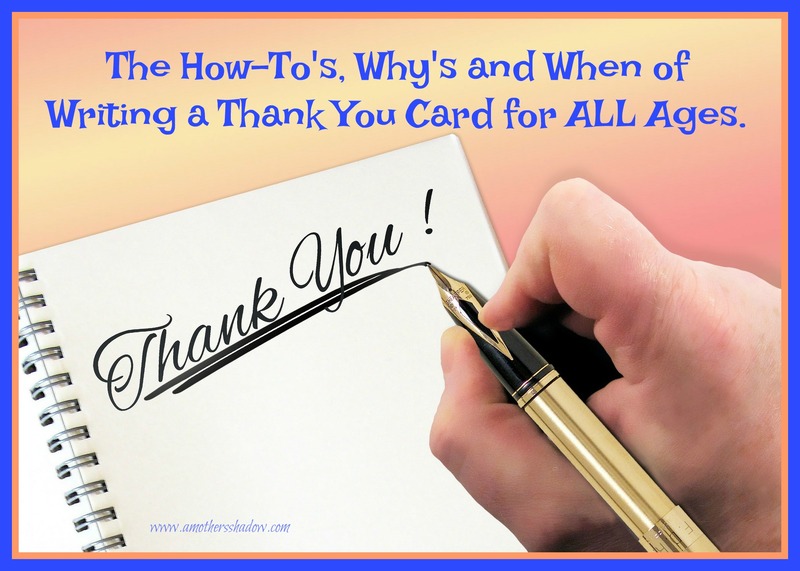 WHY IS A THANK YOU CARD IMPORTANT? I personally believe that when we sit down to write, we are unimpeded by electronic devices to interrupt our thoughts, or to quickly pull up a meme to ‘speak’ for us. As we sit with a pen and paper, we can reach deep down, think about what we want to say and how we feel, then put it on paper and feel the sentiment and thankfulness to that person as we write. It’s a connecting and emotional bond between you and the person you are writing to. 1-For you, because you are taking the time and making the effort to do something on behalf of another person who took the time, or made an effort for you. 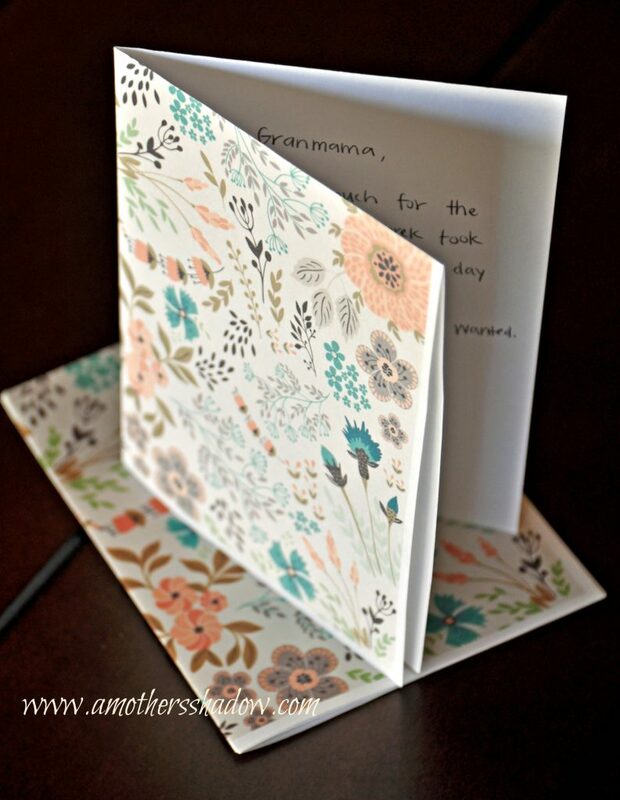 2- They can physically hold and re-read your thoughtful note. Feel the emotion that would be a hand-shake, an embrace or a genuine smile as you express your gratitude. As we write more thank you notes, we feel more appreciative, more in-tune with our many blessings, and that makes us more joyful. A big condition to writing a thank you note is not to expect anything in return. Remember, this is about them, and helping them feel better about what they did. You may never, ever hear from the person you thanked, and that’s OK! Keep in mind this process is making us better and bringing us happiness to pass on to those around us – what could be a greater reward than that!?! I hope you will make a commitment with me to write a Thank You card every week, and involve your family if possible. I have it laid out in 5 very easy steps HOW, WHAT and WHEN to write a thank you note, at ANY AGE, with all the tools you need. If you take on this challenge, please let us know how it has changed your life, or that of your family as they participate. This is a really simple, but it’s important, it’s called KINDNESS. We are going to write a THANK YOU CARD! You know, to tell someone thanks for_______whatever________. There are a billion reasons to say how grateful we are for a kindness and it’s never too late to express it! Sometimes we may not always know what to say, or wonder where to start; so let’s get the how’s, why’s – and the WHEN is NOW. It’s So Simple with these 5 EASY Steps! Paper and Pen, or whatever you prefer to write with. I have also provided free downloadable cards to choose from, so the entire family can write THANK YOU notes. Click HERE and look for: Boy’s Color-In Thank You Card, Girl’s Color-In Thank You Card, Thank You Card 1 and Thank You Card 2. Of course use any of the cards you want! Anyone who did anything positive! Etc. It’s really nice to have some recognition, and a little formality in its proper place. You really made my day when…. I want to say how much I appreciate….. Thank them for the time they took to teach you in school, to cook, to learn to change the oil in your car, to fix the chain on your bike, in a 4-H club or other youth organization. Time is precious and that they gave it up for you is a treasure. That’s it, 5 easy steps to make a huge impact on someone else’s life, and you will be amazed at the enjoyment it brings to yours along the way.